Naan Afghani, Naan Obi, Bolani, Lavasha, Roghani….they are various names of breads from Afghanistan available right here in the heart of Delhi. Thanks, to a bustling Afghan community, the traditional Naanwais of Afghanistan have been transported right here. Naanwais as the name indicates are makes and sellers of Naans or bread. Afghanistan has a quaint culture where bread is not made at home but picked from the Naanwais in the lanes. The Naanwai mostly men knead the dough and make fresh bread throughout the day. When the migration from Afghanistan started into India, many of the immigrants made Delhi their base especially Bhogal and Lajpat Nagar. With them they brought their culture of bread making to this country. Since bread was not made at home, the Naanwais soon set shop to sell the bread. The naans today are available across the city where the population has settled. So it is Bhogal – Kashmiri Lane – in the Bhogal Jungpura market where there is a sizeable portion. There is Lajpat Nagar where a lane is designated as Afghan Street, near the main market. There is Malviya Nagar near Max Hospital where many Afghanis come for medical treatment. Tilak Nagar is another area where many have settled. Bhogal is still a concentration of Aghanis. I make my way to Kashmiri Lane in Bhogal to Afghan Bakery. The friendly owner Tamim Omari, had told me over the phone that bread was available throughout the day and he would guide me. His store is a warehouse of baked delights from Afghanistan. There are traditional biscuits handmade and fresh. It is made by his three brothers in another part of Delhi and transported here also. From Baklava, Jowari, Namki to Tauti and Shrinidor.. he has it all. A fascinating find was Roht. Tamim points me to the lane saying you will find all naans there. And I do. Bhogal has around 7 – 8 bread makers. What is commonly sold is Naan Afghani, Naan Uzbeki and simple naan. Insiders claim there were 20 odd Naanwais here and with population moving abroad, their numbers have dwindled. I am not so sure, since many Afghanis have also moved to other parts of Delhi. The Naanwais start making bread early in the morning, at 7:30 am or so and continue making it till night – majorly the rolling out is done for breakfast, lunch and dinner. When one batch finishes, the next is made and put in the oven. The shops have huge clay ovens in which the Naans are baked. The Naans are all made by hand, without using any rolling pin. Mohammad Ali and his son also sell Khajuri, these are shaped like dates or khajur almost look like our Gujiyas without filling. They are more like Thekuas of Bihar. The breads are commonly priced at Rs. 20 each. The reason I am told, bread is not made at home is that one needs a clay oven. Since it occupies a lot of space in the home, it is only made by the Naanwai. The culture simply transplanted itself here. At Kashmiri Lane one can see the bread being made. At Lajpat Nagar it is sold off the push cart. It was impossible to get an idea of the different types of naan, since the younger ones didn’t have a clue and the elderly did not understand. Finally the elderly man sitting at Tamim’s shop obliged. I hope I have got it all. Paraki – Lavasa - These are simple flat roti like looking. They are rectangular in shape. This is used as a wrap. It is also the base for the famous Afghani burgers. The famous Pakeeza Burger run by the father and son duo had caught the imagination of the netizen. Their cart was immensely popular. They now have a permanent shop selling the burger. On this flat roti are spread boiled eggs, chicken and French fries. It is wrapped into a roll. It is the popular Afghani burger. 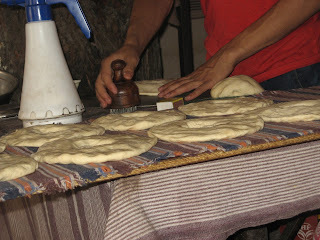 Naan Uzbeki –These are round made of maida and have designs stamped on them. Due to its appearance it is called Naan Uzbeki. 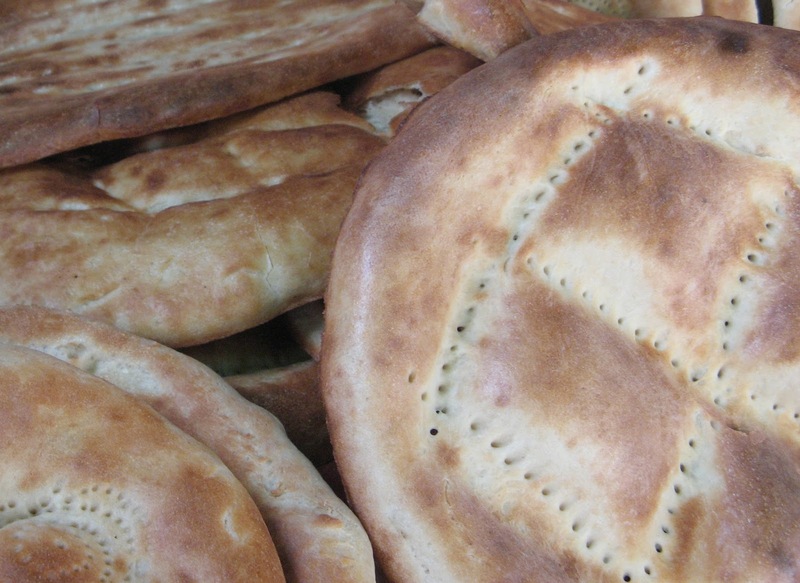 Naan Obi – It is similar to Naan Uzbeki. Naan Afghani – This is made using whole wheat. It is longish in appearance and is very commonly available. Another variant of this is the Sadha or plain. There is also a tandoor version. Roghani Naan – It is extremely soft and light. It is made with lots of oil and ghee. It is not commonly available and made during specific times. I was told to come in the evening to find it at Bhogal. To buy our Delhi Directory of Furniture dealers with 25 plus names of dealers / shops / boutiques/ craftsmen in and around Delhi dealing in old, vintage, antique, look alike antiques, furniture in beautiful wood email us at visitors2delhi@rediffmail.com. Each of the person has been carefully chosen and are well known in their fields be it as craftsmen or dealers.